SOG: RMU - 10, @BadgerWHockey 39. Wow. #Badgers Happ was 2-15 from the line in the last four games. Is 6-9 so far today. Back on the ice at LaBahn. Back on the court in DC. We'll take the rock the second half. We'll take the rock to start the second half. Hayes, whose game began with back-to-back airballs, has 15 points and can add to it after the break. UW up 45-28, 15:51 left. #Badgers have a 45-28 lead with 15:51 left. Happ up to 14 and 7. He is 8-11 from the line. That is 72.7%. Sanjay Lumpkin picks up his fourth foul at 15:51. Badgers lead 45-28. Hayes with 15, Happ with 14. It's 45-28 Wisconsin. But guess what? Northwestern is going dancing for the first time ever so it's not all bad. Out-scoring Cats 16-6 in the paint. Cats' McIntosh had 25 points and 7 assists in first meeting. He has 4 pts, 2-8 shooting today. The #Packers new TEs combined for 105 catches, 1,200 yards and nine touchdowns last season. Great cut by Illikanen who takes the assist from Trice to put Wisconsin back up 17. Kind of the story of this second half so far: NU misses two open threes. Wisconsin cans one. Benson gets blocked at the rim. #Badgers Brown with a bad TO but then hits a 3 and comes up with a block/tie-up. #Badgers up 51-33 with 11:56 left. Hayes has 16 points and 9 rebounds, Happ has 14 points and 8 rebounds. Scottie Lindsey leads all Northwestern scorers with 12 points. 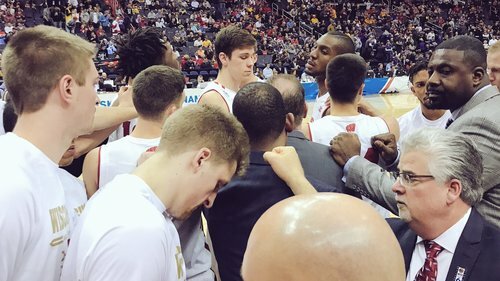 Wisconsin comfortably ahead 51-33 with 11:56 remaining. Happ, Hayes, Koenig and Showalter have combined for 46 of the points. Koenig & Showalter with 8 points each for the #Badgers . Clark w/ a gorgeous goal from inside the offensive zone circle. UW up 7-0. Guess we get sprinkles and a cherry to go with the ice cream. Northwestern has one assist in this entire game. ONE. Vitto for THREE! Wisconsin up 23! Now Vitto Brown getting in on the fun. 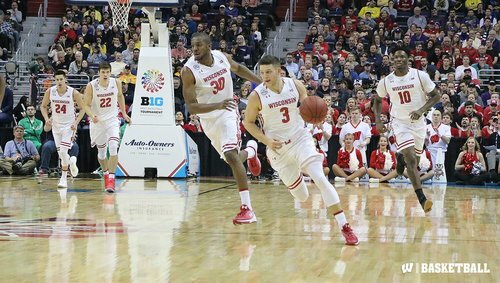 #Badgers have a 56-35 lead with 10:21 left. Midway through the second half, Wildcats are shooting 29.3% from the floor. 18.2% from three. Trice for three!! Badgers up 59-35. Chris Collins takes timeout down 61-35. Wow. The #Badgers are playing unbelievably well right now. The lead is 26 points -- 61-35 with 9:36 left. It is official. Northwestern is a feel-good story but #Badgers are better team and hammering the Cats (61-35). Here come the #Badgers ! Wisconsin steal by Trice followed by some good passing and a layup by Happ. Badgers up 61-35. NU timeout.